Every morning on the Daily Dot, we share an animated GIF we’ve just discovered. We like to set the bar a little higher than cute kittens in peril or a YouTube video rip. 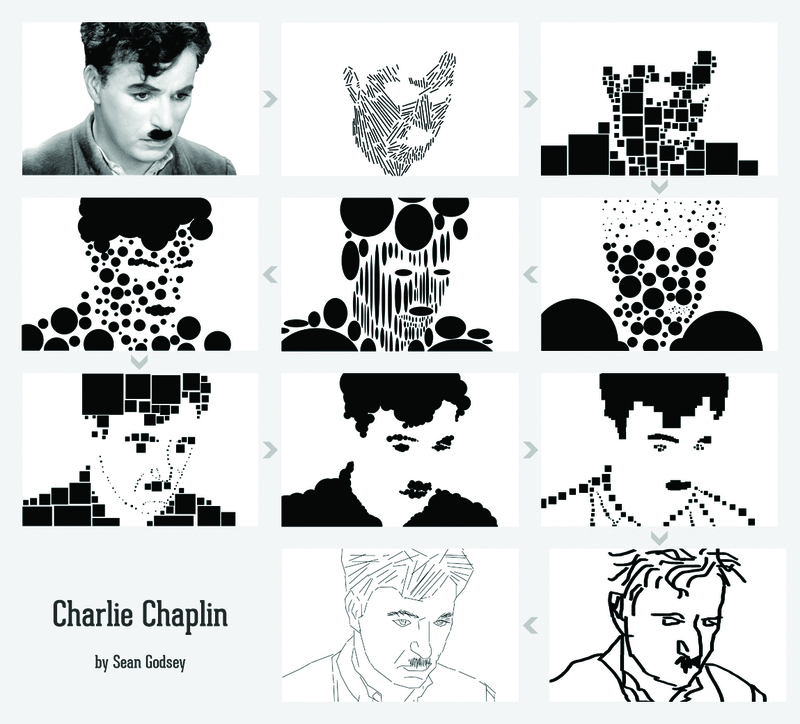 Sometimes we uncover something truly remarkable, as with Chicago artist Sean Godsey’s animated image of Charlie Chaplin from The Great Dictator. Launched on Tumblr, the image collected more than 700 notes there before spreading to Google+, Reddit, and the rest of the Web. Godsey spoke with the Daily Dot via Google Talk to explain his creative process. All artists work better on deadline, and Godsey is no different. This image—the first GIF he’d ever created—was part of an assignment for a motion-graphics class at Columbia College Chicago. This particular series of images came together in two hours. Putting as little conscious thought into the process as possible, Godsey took apart and then reassembled the image. It’s remarkable something produced in this way gives us so much to ponder, but perhaps the subconscious speaks louder through art than the conscious mind. Going from primitive line drawings to blocks and circles, increasing granularity and complexity with each transformation, and finally resolving into the fully realized Chaplin photo speaks eloquently of the process of perception and selfhood. Now Godsey’s hooked on creating GIFs for his Tumblr scannedlife. He also works as a manager for a local theater and writes comedy. He has plans to bring together the world of digital art and live theater. Godsey’s GIFs may seem to be just a stepping-stone to more ambitious projects, but viewed purely as art, they succeed. Movingly.